I am stingy with 5s on Good Reads. I only give 5s if there is something really wonderful, insightful, clever, or life-changing about a book. 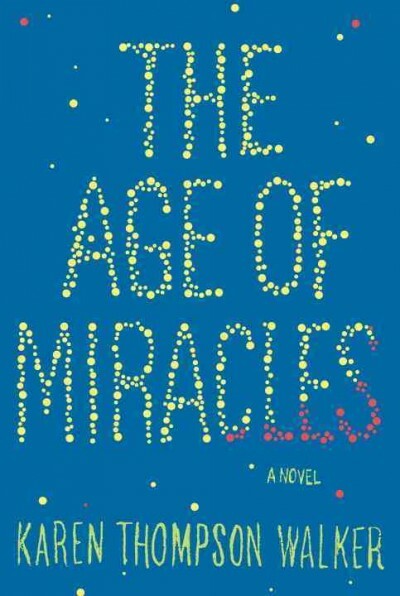 I gave Karen Thompson Walker's The Age of Miracles a 5. First of all, I was in the mood for this book. After trying to choke down *Brady Udall's Lonely Polygamist (and failing because I hate the way he writes about women which is a problem that multiplies exponentially when your topic is polygamy) for last month's book club, this story really hit the spot. I loved it. It's not a crazily fantastic story. But when I got to the end of it, I felt like it was real. The story is about a girl named Julia and her family as they deal with the slowing of the rotation of the earth. Days start lasting longer. They have to start sleeping when the sun is out and going to school in the dark. Some people go off the "fake" clock time and try to stretch their circadian rhythm out to match the cycle of the earth. It's pretty interesting and new, in terms of apocalyptic-type stuff. No zombies. But it is mostly about Julia's coming of age. The book almost feels slow, but not in a boring way. Nothing huge happens (except the slowing of the earth) but the book is still compelling. It's good writing, too. At least, it's to my taste. The reason I gave it a 5, though, is for about 3-4 scenes that I thought were so poignant I can never forget them. I want to prepare you for spoilers. They are coming. Please get ready. I'm going to briefly describe these small little scenes in the book that make it recommendable and worth reading—That's how I think of a Good Reads 5. One scene is where Julia buys a bra. I remember when I got my first bra very vividly and kind of shamefully. It's not my mom's fault or anyone's fault, I was just super self-conscious. My friend Rachel had all these mean older sisters. One of them took us bra shopping. In hindsight, she was pretty nice to take us bra shopping. She made us try the bras on out in the store on top of our clothes. I was horrified. In the book, Julia uses her own money to buy a bra from a drugstore. She picks a nice, tasteful one. When she gets it home, though, she sees the bra more clearly and realizes that it is cheap, ugly, and embarrassing. She throws it in the garbage. Another scene that just about kills me to think about involves Julia's grandpa. He is a quirky but loving sort of guy, like most grandfathers. I just want you to know that I'm going to talk about something that happens in the book and it might ruin the book for you so read the book first if you don't want it spoiled. OK. Here goes. Her grandpa goes missing for a while. They think he may have joined some of the people who are off clock-time. But then, after a few weeks, they find his body. It's in an old bomb shelter in his back yard that he was fixing up in case they needed to stay in it for the slowing of the earth. He fell off a ladder. He was stocking it up with board games for him, Julia's parents, and Julia. It's clear that he was just taking a load down before they were picking him up to go out to dinner for Julia's birthday because he's dressed up in a corduroy jacket with a birthday card for Julia in his pocket. This wrecks me, for some reason. It's the detail of him thinking they would want to play checkers in there and how he got dressed up in a corduroy jacket to go out to dinner with her. It's so sad, and really poignant and sweet. Also, Julia finds out that her father (and, be forewarned because this is a spoiler too) is seeing another women. He's not honest. Julia knows but her mom doesn't. There's an accidental encounter with Julia and her dad at the women's house and it appears that he is going to leave with her and move away. He's really mad that Julia saw him, but he knows he can't be mad at her because he's being a big jerk. It's complicated and sad. That day is the day they find the grandfather's body. Julia's dad comes home. Her mother never knows, but their relationship improves. Julia never tells her mom about her dad's affair. I like that even though this book has this kind of fantastical element about the earth slowing, it's very realistic and that even in the face of all these things happening and when life as we know it changes for good, it's still the story of this little family and the seemingly small choices (lies and decisions) that are at the heart of the story. I guess it's kind of sad. But I liked it. 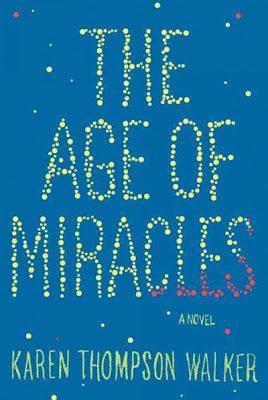 I think the age of "miracles" refers to these small acts of connection people have with each other, maybe even a family that endures, albeit imperfectly, through something hard. At least that is how I like to think of this book. *A lot of people like The Lonely Polygamist. They are great people. I'm just not one of them. I also like spaghettios, so you can't go by me. Agree. About everything. Such a gorgeous book. Also appreciated this book. Your reviews are always fun to read. i really really wanted to love the "lonely polygamist", and i tried, but i couldn't. i am so happy to know that i am not the only one. i did love "the age of miracles", though. and that phosphorescent song will not leave my head. i really feel like we could have been friends in real life. Hi! http://www.zuup.com/what-is-zuup here. I found your blog really awesome. I will keep on visiting your site and be updated with your latest post. Have a great day!! Yes! I really enjoyed Age of Miracles for the same reasons. I still think about that last can of pineapple. And after reading most of The Miracle Life of Edgar Mint, it would take some high praise for me to jump into anything else by Brady Udall. His writing is sharp and clever, but dark and so disturbing. I just barely finished the book tonight. I read it because I wanted to read your post but didn't want anything spoiled. I am a dork like that. Since I just finished it I'm still chewing on it. I will say that it is beautiful and kind of haunting. I am really glad I read it, thank you so much for reviewing it. I love that you're a dork like that! I am too. I agree—the book is beautiful and haunting. I also ran straight to the library to get it so I could read your post and compare notes. I was so touched by the little details of the world of middle school, casual cruelties and nervousness in front of cute boys, choosing the perfect outfit for picture day and then accidentally making a weird face, finding out why you were or weren't invited. The crushing shyness and awkwardness that matters less when you have someone who loves you and gets you. And the way all of that is both unchanged yet amplified in the face of the end of the world. My husband LOVED The Lonely Polygamist, like laughing out loud the whole book. It kind of made me think, "who is this guy?" You're reminding me of such great details in the book. Yeah, I'm not sure about The Lonely Polygamist. I kind of hate it. Oops, didn't mean to be anonymous. I'm Catherine. Hello! Its me http://www.zuup.com/ and I found your blog really amazing. Your blog post are really interesting. I will visit your blog regularly to check out for your new post. Thank you.. Have a nice day!! Just put this one on hold at the library. More book reports, please. I'm about to have a baby, and I always read an enormous stack of books during those first few weeks of newborn round-the-clock nursing. 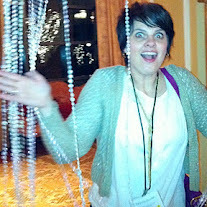 Then I get to come back to your blog and compare notes.